Chainlink fences everywhere are going to be rattled after this post! 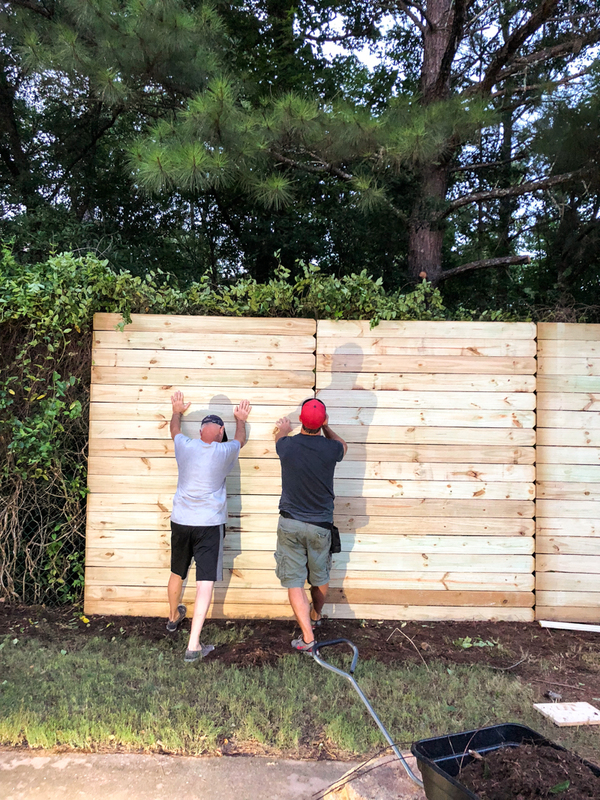 Today is the day where we share how we transformed our chainlink fence into a wood fence with wood panels! 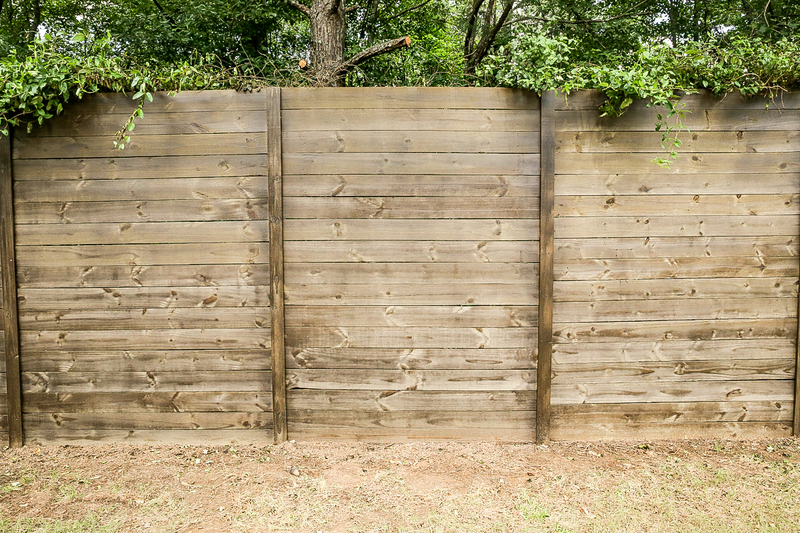 It’s one of the easiest and most effective fence DIY’s and I am SOOOO happy with the end result! 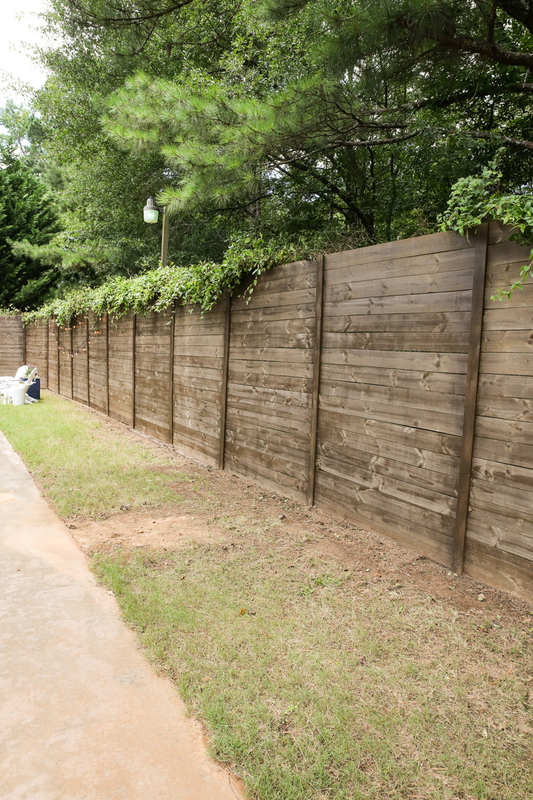 In reference….this is what our fence looks like now…. And this is what it looked like before…. 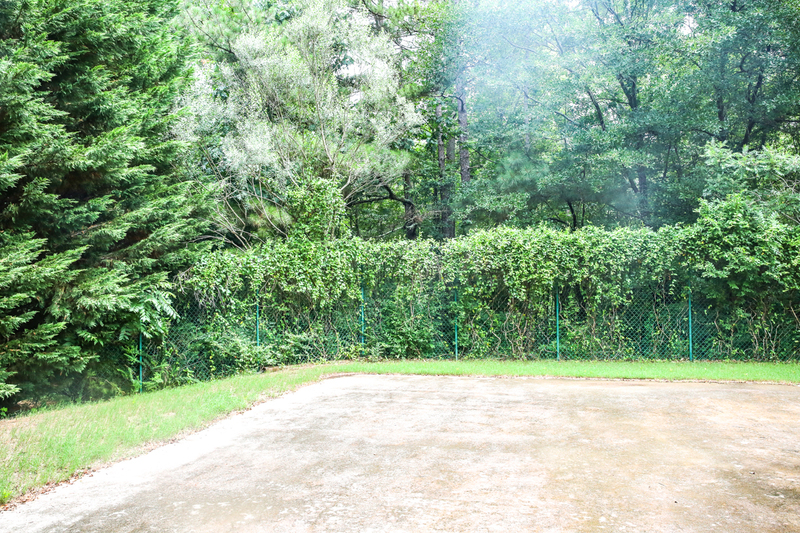 We have a chainlink fence that wraps around two sides of the concrete pad in our backyard. 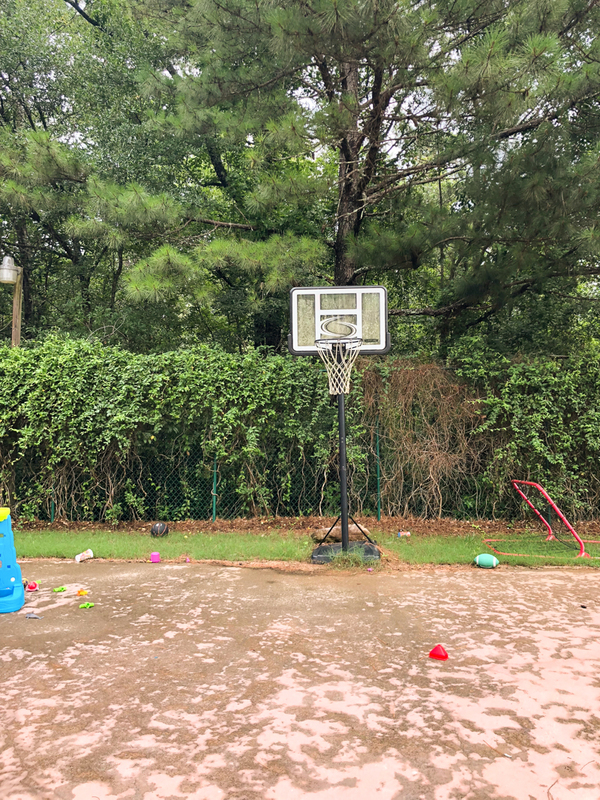 We call it a pickle ball court because it’s not quite big enough for tennis but really we do a lot of bike riding, chalk drawing and general playing on this bad boy. Part of the fence is very close to the leyland cyprus trees on the left of this photo so we never see it. The other part of it is overgrown with honeysuckle (which I am personally very fond of in the summer!). 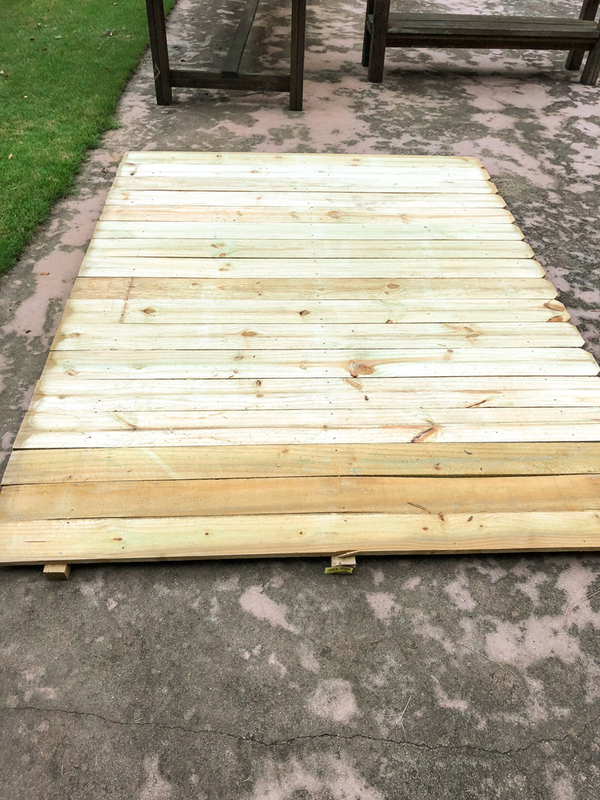 This was a weekend warrior type project for us and we headed to the Home Depot to pick up the lumber. 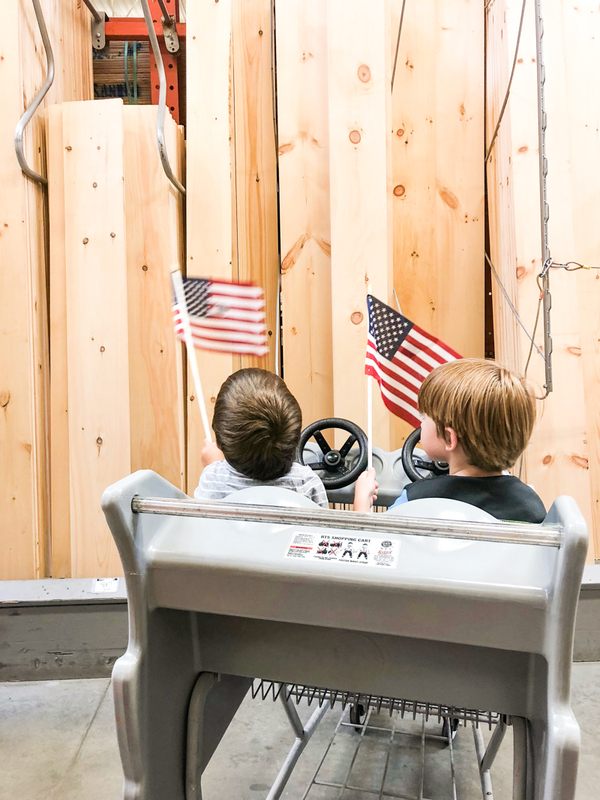 At first we were going to build all the panels to cover the fence so we priced everything out in the lumber department. 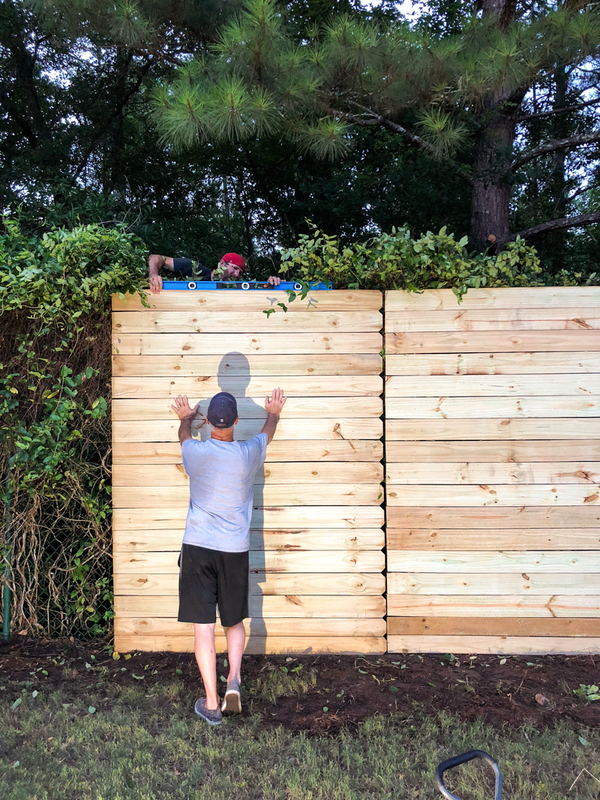 As we were figuring out how many pieces of lumber we needed and how much everything would cost, Jeremy said – why don’t we just use these pre-assembled fence panels. Note my father-in-law modeling these fine panels…. Since we really needed it to be eight feet high and these were only six feet high (the dog ear goes at the top) it would require us to flip it on the side to get the height we needed. BUT since we were already planning on doing a horizontal fence (to match our garden fence), rotating this bad boy was actually already needed. 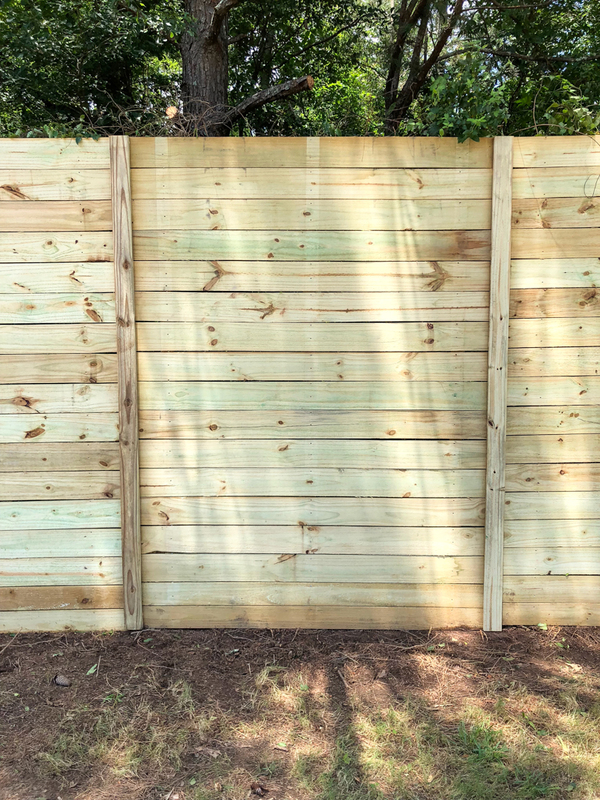 The only real difference between the panels we would have constructed was the price (these were approximately $7 more per panel) and they had the nail holes on the front (where we would have attached everything from behind to get that clean look. The panels had quite a bit of color variation when we got them home but that didn’t bother us. The other small detail to note that the horizontal back supports (which are going to become vertical back supports when we rotate the panel) stick out the bottom. So that would be an additional little trimming that needed to happen. 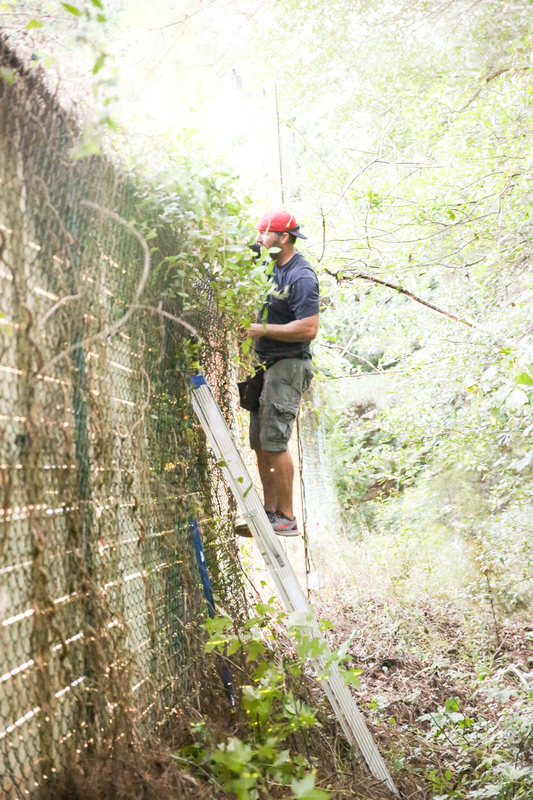 Speaking of trimming, the honeysuckle needed a little bit of help in some areas to free the fence to be able to attach it. The guys also tackled the clean up of this area too. 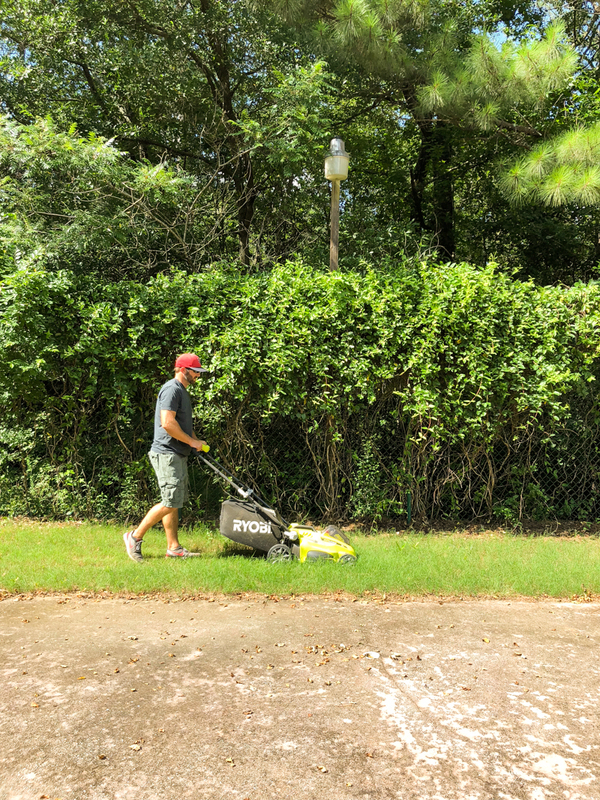 (and yes, that is the Ryobi battery operated mower. It is so light that I can lift it and guys I struggle doing a pushup. That’s how easy it is!). 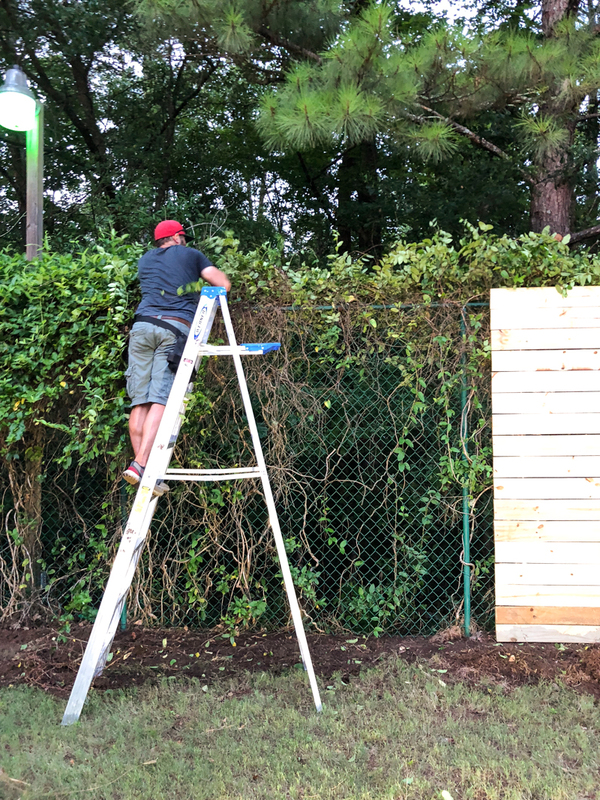 Okay so the real question that everyone is wondering is…..
HOW DO YOU ATTACH THE PANELS TO THE CHAINLINK FENCE?! 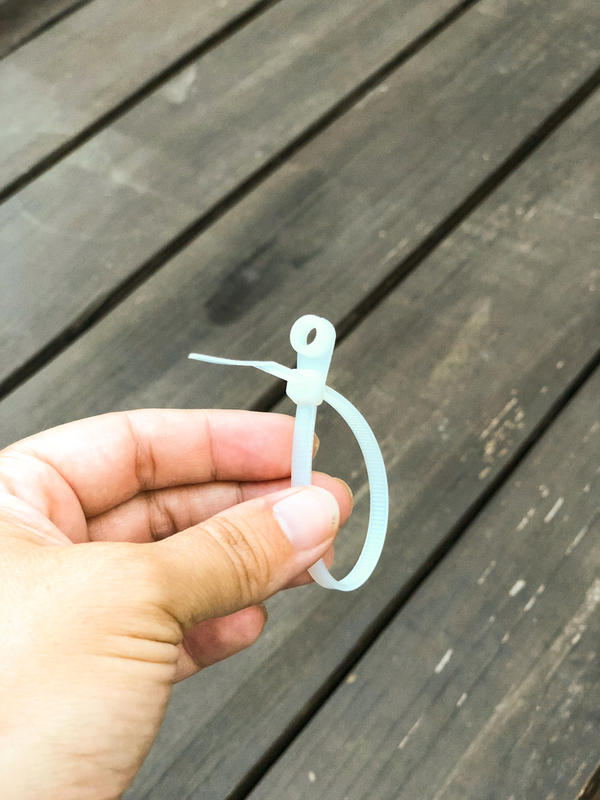 Well, we got a lot of advice from my friend over at Iron & Twine because she tackled a very similar project and she recommended using these little c-brackets. 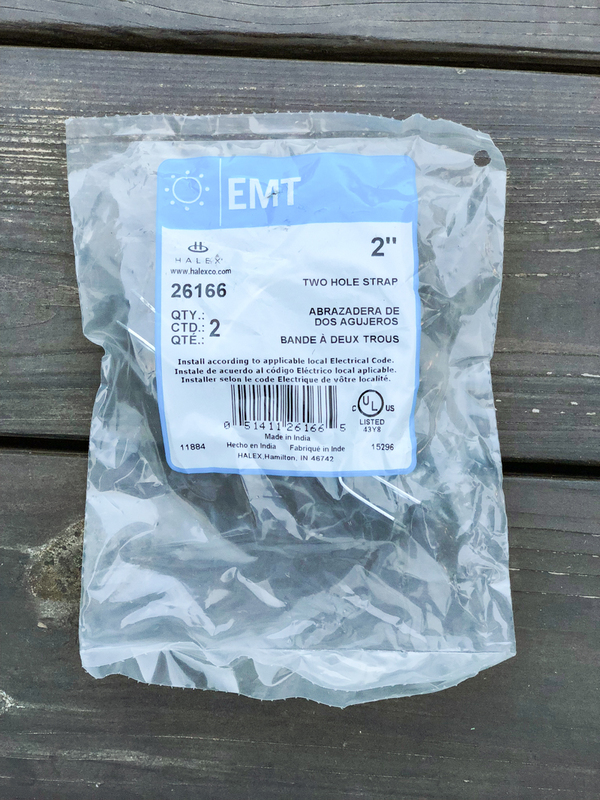 They are technically called a TWO HOLE STRAP. 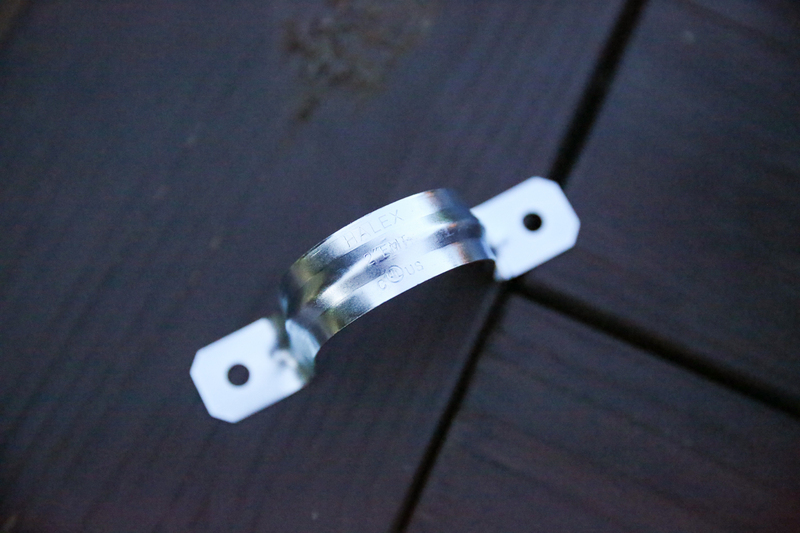 We bought the 2″ ones and used exterior screws. 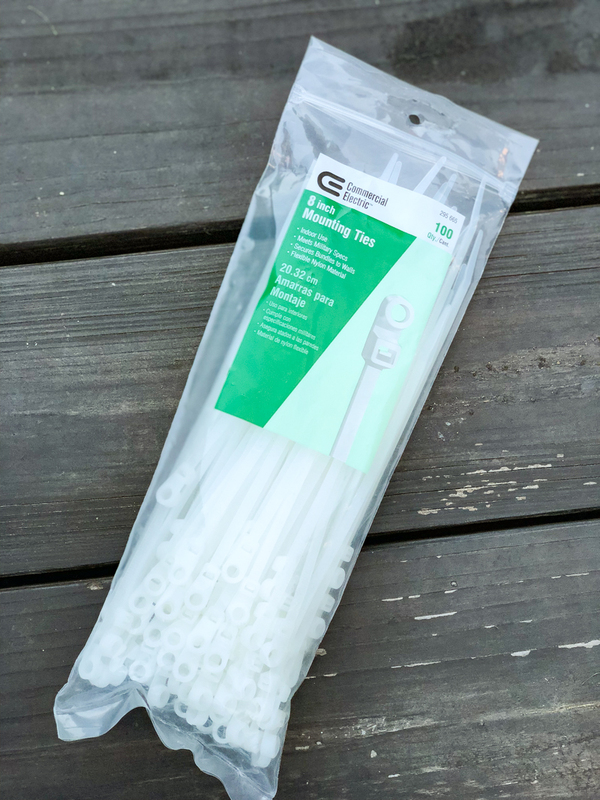 We also bought these mounting ties (I call them zip ties) but they are for electrical use. We used them to screw directly to the fence and then zip tie the chain link part to pull tight. This is how they look…. For our fence we needed a TON of both. This was our original shopping list – at least 48 of the c brackets and all the pickets (which we replaced with the panels) and then a bunch of 1×3’s. The guys had to hold the first panel in place to get it right and it did require them to shim it up higher (because the ground dips right there). Jeremy went around back and used the c-bracket around the horizontal metal fence piece and attached it to the vertical wood support of the panel. The zip ties were a whole lot easier to take photos of because they weren’t 8 feet high and crowded with honeysuckle. Jeremy did at least two c-brackets on each panel and several zip ties. The other key thing to remember is that we always had the dog ear part of the fence on the right. Having two dog ears sections meet each other would require a thicker piece of wood later to cover it. I’ll go into that more later. When it came to the panel installation, both guys would carry and align the panel. 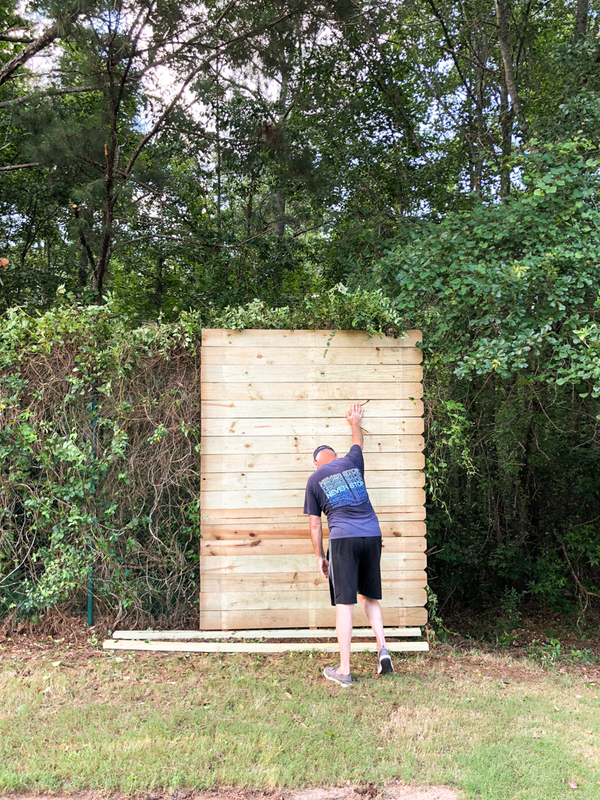 Then Gramps would hold it in place while Jeremy went around the other side, adjusted the ladder, made sure it was level (if it wasn’t then he had to climb down, come around the other side, make some adjustments with shims and go back), and then attach the brackets and ties. Panel by panel it became more of a fence. 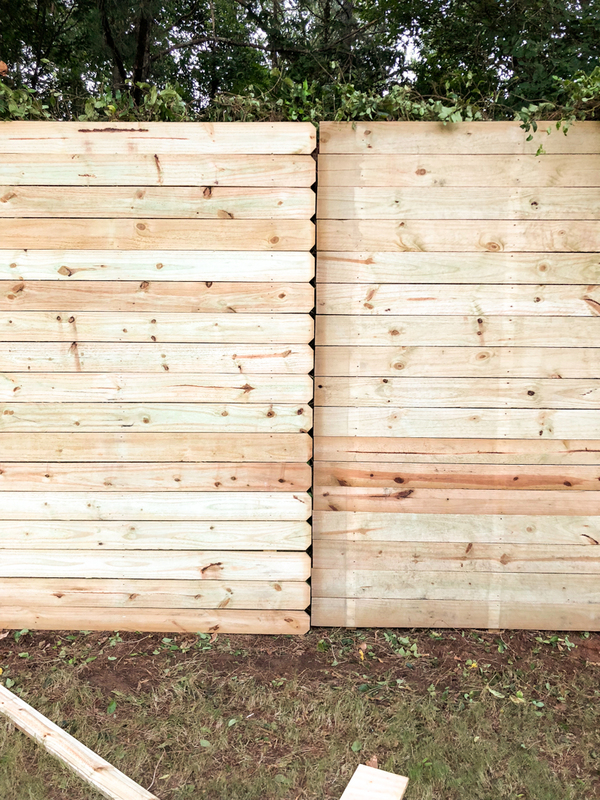 To make it look more like intentional and less like vertical fence panels on their side, we needed to attach 1×3’s that would cover the dog ears. This is the end goal…. 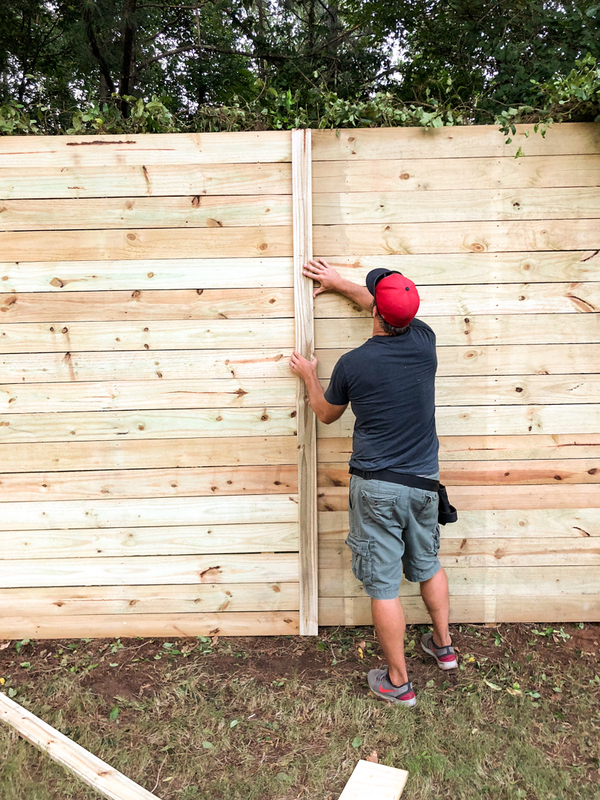 The fence panels sometimes had a little bigger gap and sometimes not – so that is why you want to make sure the dog ears were all in one direction….otherwise, it could create a space or the dog ear would be visible even after attaching the 1×3. Jeremy cut them to size before attaching. Then he put construction adhesive on the backside and attached them with exterior brad nails. 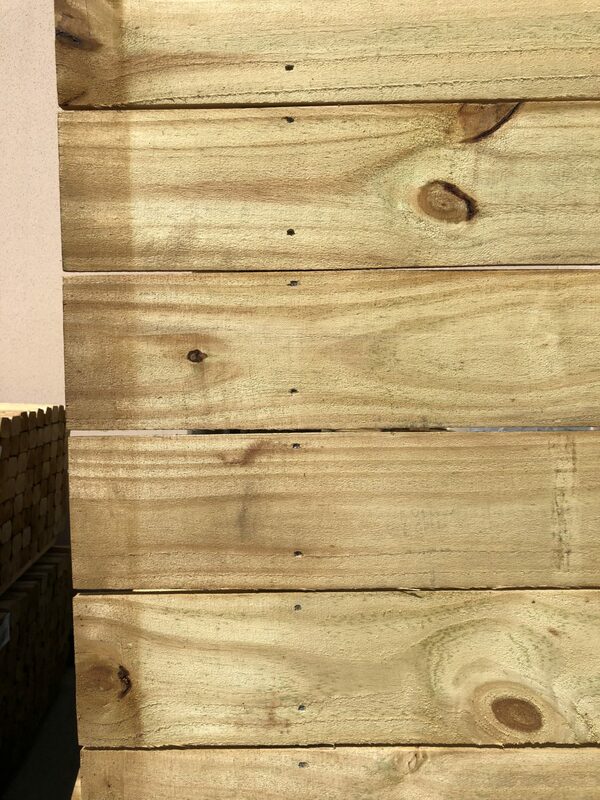 Even though the panels align at the top and they were manufactured to be very much identical – you can see that the wood slats on the bottoms do not align perfectly. This doesn’t bother us and we don’t notice it at all….but if you are that person that knows it bothers you….this might not be the project for you. For us, that vertical 1×3 breaks it up enough so we don’t see it. The end result is GORGEOUS. 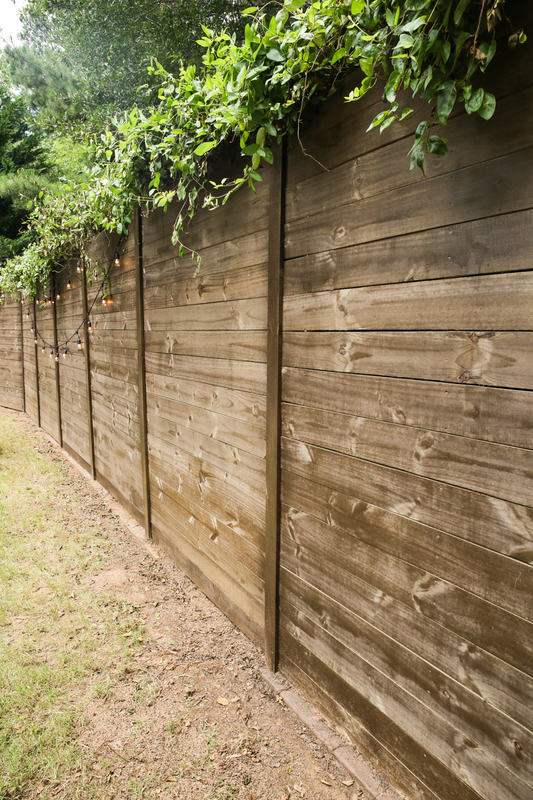 I mean seriously…..have you ever seen a more beautiful fence?! Say no. The answer is no. It took Jeremy and his dad roughly 1 and a half days to install this. We had 16 panels. The end result is REALLY pretty and I am sooo glad that I stuck to my gut about transforming the chain link. And just so you remember….we went from this…. To this….and no, I do not regret the cascading honeysuckle. It is the cherry on top! Hope that helps anyone else out there that might have a chain link situation. If you tackle this at your house, I’d love to see your transformations. Those make my day! And here are the links to the products we used in this project. If you have any questions – put them in the comments! That looks so good!! Did Jeremy get poison ivy during this? I was itchy looking at the photos. Love honeysuckle vine but it almost always has some poison ivy intertwined with it. I can just look at it and catch it. This was an amazing transformation Katie! Love the results. Are you seriously the sweetest human or what?! I mean…thank you! Thank you so much for being such a loyal friend and follower! That means sooo much to me! Hahaha – I don’t think so but the bugs lit him up! 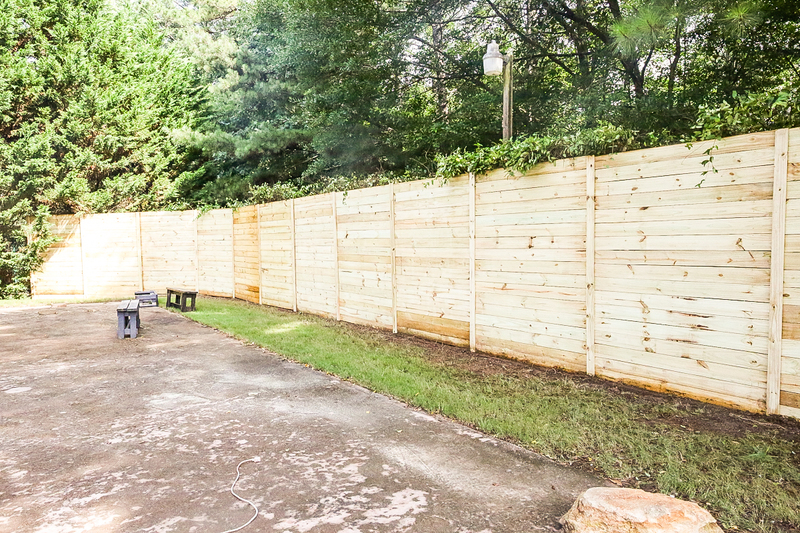 Your fence is awesome – this is one of my favorite projects you have done. 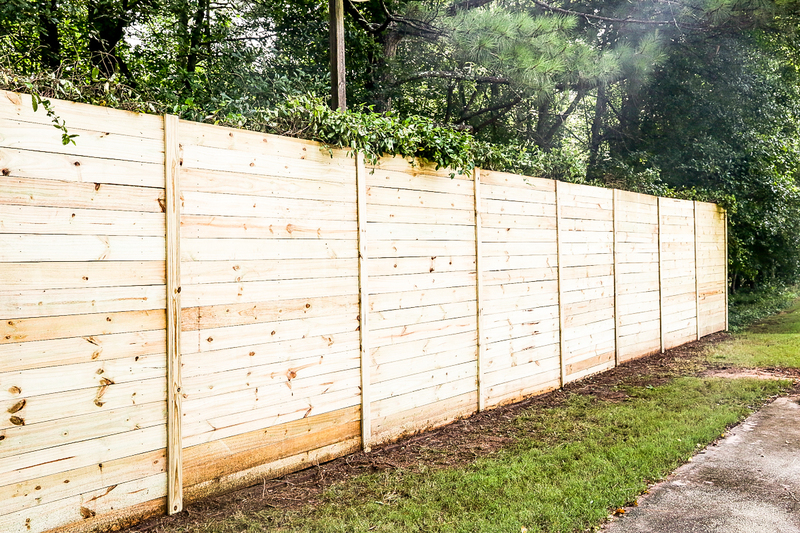 Your chain fence was very tall – think this would work on the average 4 ft high fence? I never thought I’d say this.. but I REALLY wish I had a chain link fence right now! I would love a fenced yard – and will definitely be using this as inspiration when the time comes (minus the chain link backing, hopefully!) since we’re starting with zero fence at all. Love this! 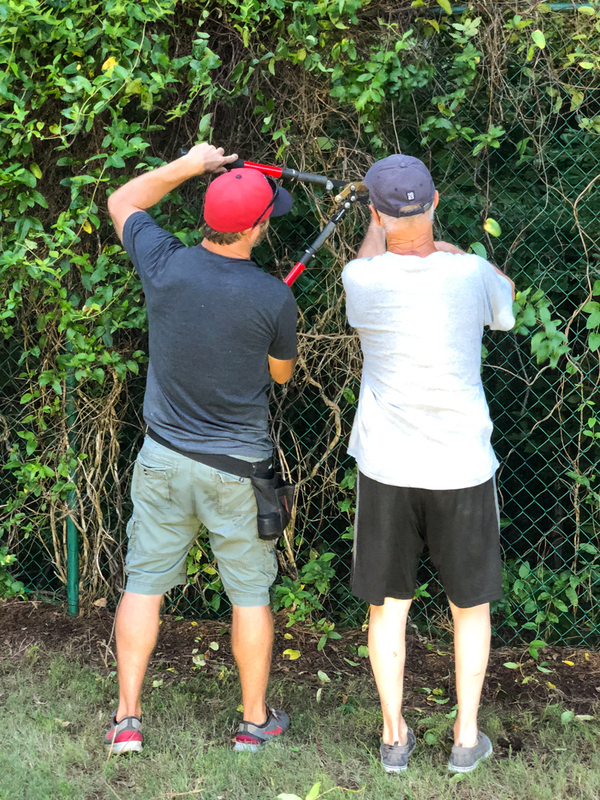 We had a chain-link fence at our last home which I wanted to hide but I never thought of something like this as a solution. Well done! I’m a long time follower, too and love all that you do! You’ve inspired me to upgrade our chain link fence! Our fence goes around the entire backyard and we have gates on either side of the house. Do you think the panel would work attached to the gate if it was cut to the right width? 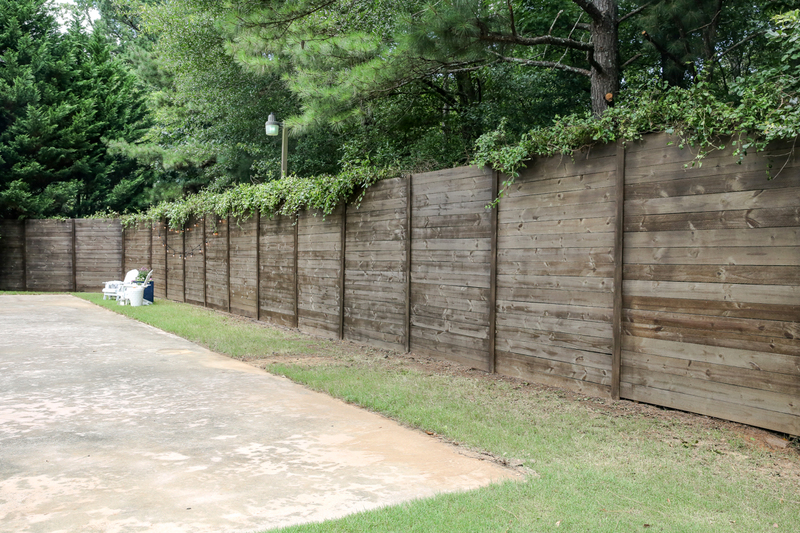 Also, our fence is 4′ high. Do you think it can support an 8′ high panel? Those are my 2 concerns. Hoping you have some expert advice to offer. Your family is beautiful! Now I’m wondering if I can do this when I don’t own the chainlink fence on the other side… Our “driveway” is a dead end street that ends at chainlink to a church parking lot. We built up a retaining wall along it and added burning bush which I was hoping would fill in so much faster than they are (I used crappy soil), but this would make it lovely even in winter. When they plow the adjacent lot in winter (Boston = LOTS of snow) they usually end up destroying that fence and have to pull the poles upright come spring. So if they do that, would this would just get destroyed too or would the added weight hold up with plows and bobcats pushing snow on it? Well, now you know my whole plight. All to say, I love this and it turned out really gorgeous, especially with the lovely greenery cascading over the top! What a transformation! I love the horizontal panels too. 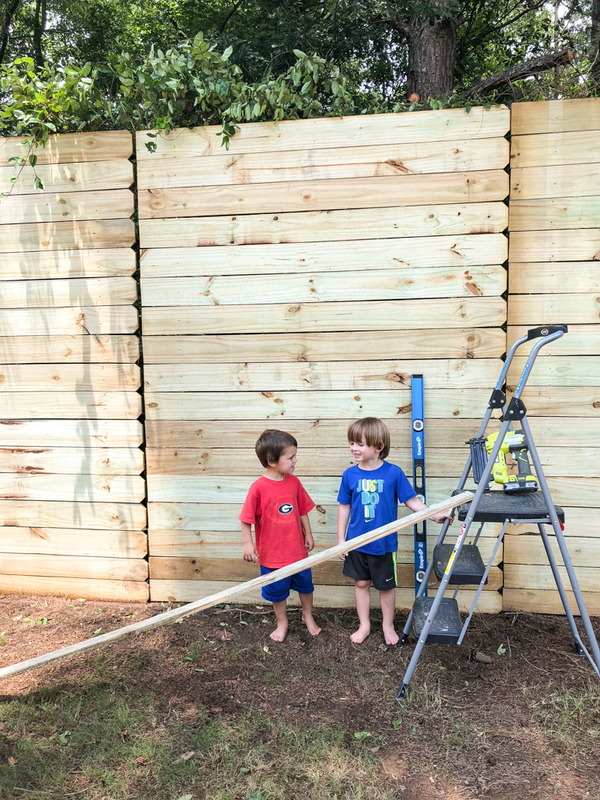 That’s awesome it was so quick using this strategy – my husband took about a year and a half to finish putting up our fence, lol! This looks amazing. Keeping the honeysuckle makes the fence look like it’s been their longer and makes your home look more distinguished. I absolutely love it. I honestly have no idea. I wish I was more help. I think you could possibly get away with a 6 ft panel but the doubling would be very high. I would hesitate. I would definitely think this type of idea would work but maybe not with these panels. I would question whether the doubling of the height would be too much. Maybe a 6 ft panel but having something 8 ft would be a little top heavy. This is gorgeous! I love that you just turned the panels sideways, genius! We have a chain link fence too, but we installed slats in it to look better. I don’t have a picture, but these are the slats we used so you can get an idea. Yours maybe looks better, though! We do not. However, I do have friends that did it and they also attached panels on the back side as well and it looks great! 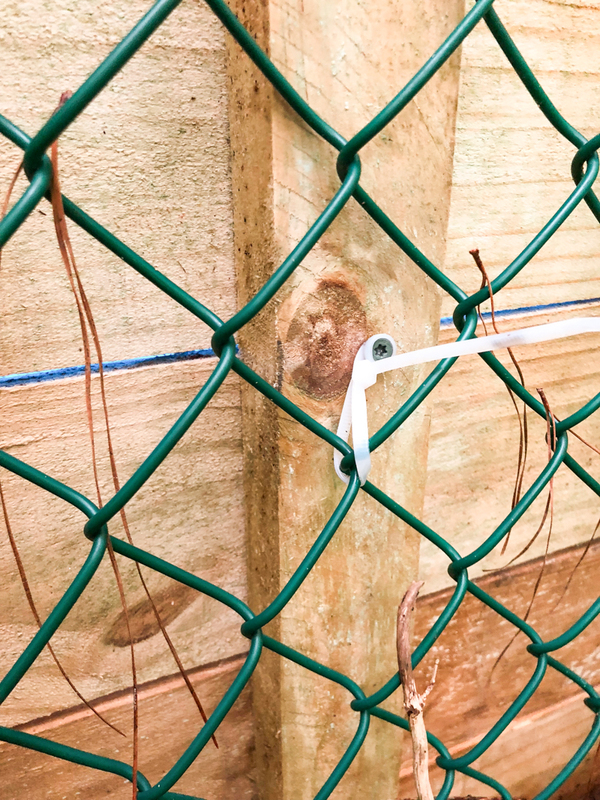 I converted my 4′ chainlink fence to a 6′ wood fence, but kept the panels vertical. I love the horizontal look! In order to keep both sides looking fresh (without doubling up the panels) I removed the chainlink and just kept the posts. Saved me a bunch of time digging new post holes, and I was able to cover them up with a couple extra pickets!